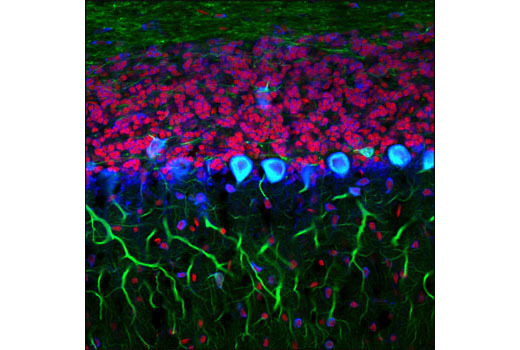 Confocal immunofluorescent analysis of rat brain using S6 Ribosomal Protein (54D2) (Alexa Fluor® 647) Mouse mAb (blue pseudocolor) and β3-Tubulin (D71G9) XP® Rabbit mAb #5568 (green). Red = Propidium Iodide (fluorescent DNA dye). 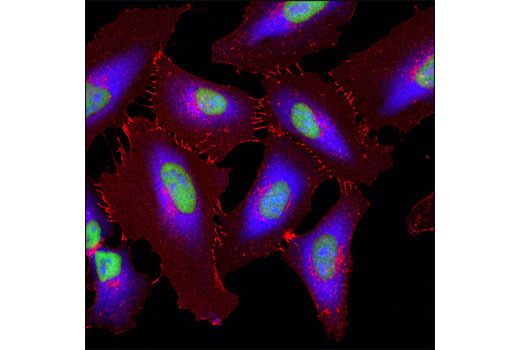 Confocal immunofluorescent analysis of HeLa cells using S6 Ribosomal Protein (54D2) Mouse mAb (Alexa Fluor® 647 Conjugate) (blue pseudocolor), β-Catenin (L54E2) Mouse mAb (IF Preferred) (Alexa Fluor® 555 Conjugate) #5612 (red) and Histone H3 Antibody #9715 (green). Flow cytometric analysis of Jurkat cells using S6 Ribosomal Protein (54D2) Mouse mAb (Alexa Fluor® 647 Conjugate) (solid line) compared to concentration-matched Mouse (MOPC-21) mAb IgG1 Isotype Control (Alexa Fluor® 647 Conjugate) #4843 (dashed line). 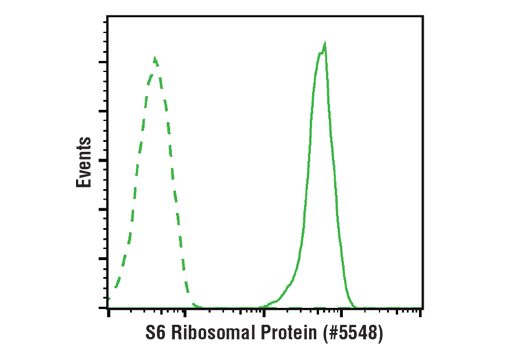 S6 Ribosomal Protein (54D2) Mouse mAb (Alexa Fluor® 647 Conjugate) detects endogenous levels of total S6 ribosomal protein. This Cell Signaling Technology antibody is conjugated to Alexa Fluor® 647 fluorescent dye and tested in-house for direct flow cytometry and immunofluorescent analysis in human cells. The antibody is expected to exhibit the same species cross-reactivity as the unconjugated S6 Ribosomal Protein (54D2) Mouse mAb #2317.